We wanted to have an all-in one solution concerning home lighting. With this device it should'nt be necessary to use the light switches anymore. It aims to improve energy efficiency and decrease light pollution with intelligent lighting. Further, lights are a good way to provide feedback and keep you safe in case of bad airquality or even hazards like fire breakout. The device keeps the brightness of the room at a user-defined level regardless of enviromental influences. It provides a smooth transition between day and night and keeps energy use at a minimum. With the use of multiple sensor data is detects if the room is used and controls the light accordingly. As a health and safety feature air quality and temperature is monitored, triggering optical alarms if critical values are reached. In an event of danger, emergency contacts e.g. family members will be informed. Using multiple sensors the device can assess the environment and change colour and brightness of the lights. A PD controller regulates the brightness using ambient light measurements of the sensor. 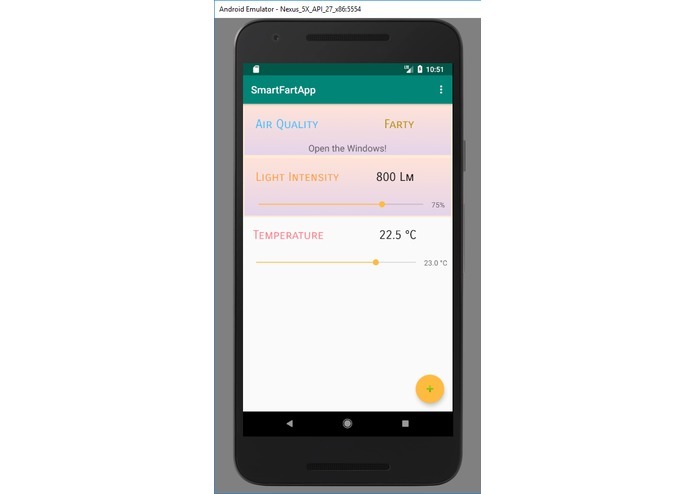 To check for the presence of people it analyzes the change in CO2 concentration and motion over a timespan in the room ensuring a correct detection. To detect bad air quality the CO2 and the TVOC concentration are monitored. When critical levels are reached light will flash peridocally.For fire breakouts the temperature is further monitored and lights will flash rapidly. As most of us are not very experienced in project and team managent, coordinating five people was tough but solveable. Additionally we didn't plan out the whole project in the beginning and changed ideas on the fly. Raspberry Pi stopped working multiple times expected burnout.